For a quarter of a century, Feeder have endured as one of the UK’s most consistent rock bands, outlasting many of their peers and still going strong. We sit down with frontman Grant Nicholas and bassist Taka Hirose to talk through the instruments that have shaped their musical journey. 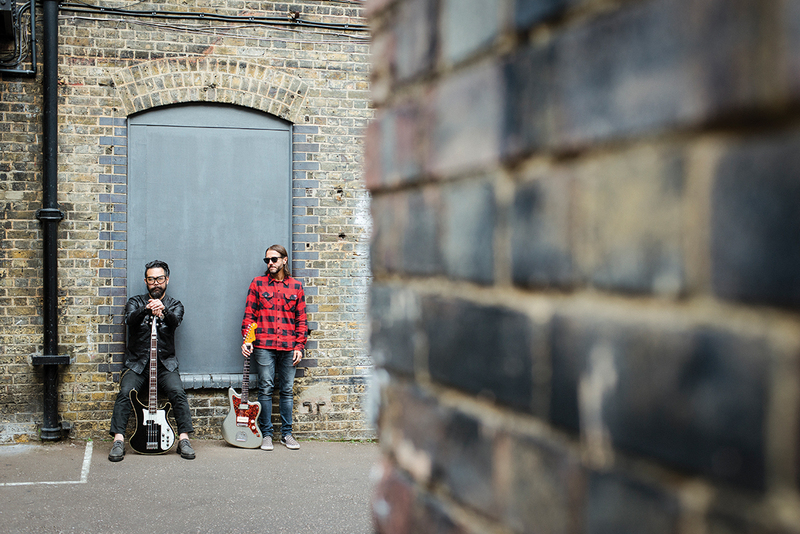 It’s been 21 years since Feeder released their first album, Swim, and over 25 since Newport friends Grant Nicholas and Jon Lee met Japanese bassist Taka Hirose in London, and set themselves on a path that would lead to top five hit singles, platinum-selling albums and major festival headline slots. “It’s a long time isn’t it? I never expected us to last this long!” jokes Taka. “Probably not!” adds Grant. Talking guitar is what we’re here for, and it’s a subject that the pair both know very well indeed. 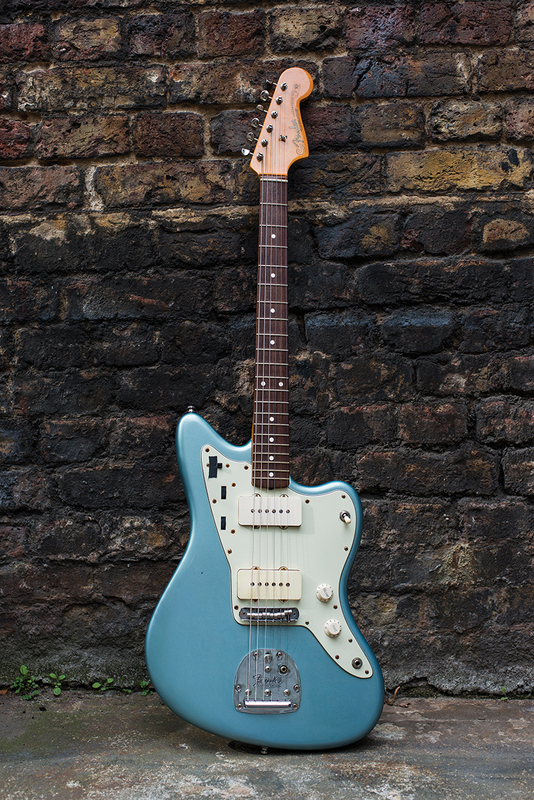 Grant has a love affair with Jazzmasters that borders on the obsessive – and he came to Fender’s quirky offset at a time when not a lot of people in the UK music scene were playing them. On the flipside, Taka’s bass collection is a fascinating mix of classic designs, boutique curios from his homeland, and most interestingly of all, instruments that he’s built himself under the brand ReBirth. It seems like an unusual thing for a rock star to do, but it makes sense when Taka shares the details of his pre-band career. 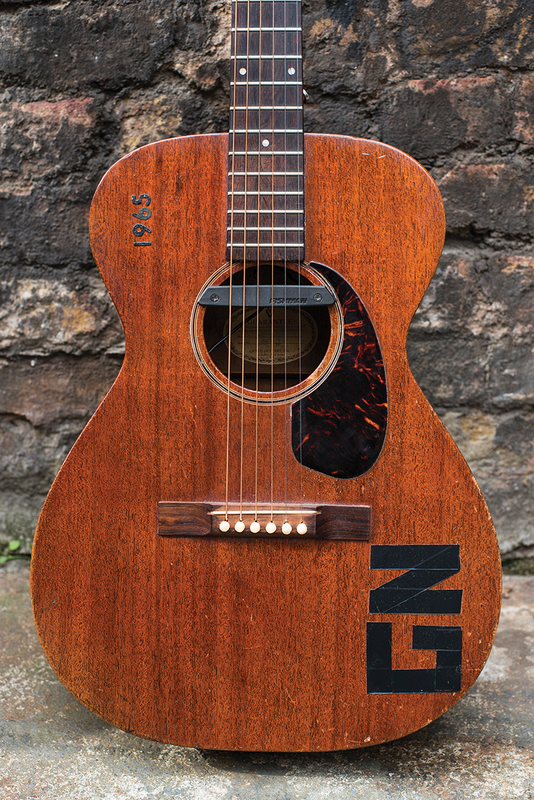 Grant’s collection of guitars extends far beyond the instruments he’s brought with him to share with us today, but they’re the ones that mean the most to him, and there’s no more special guitar to him than his 1966 Jazz, affectionately known as ‘Old Brown’. 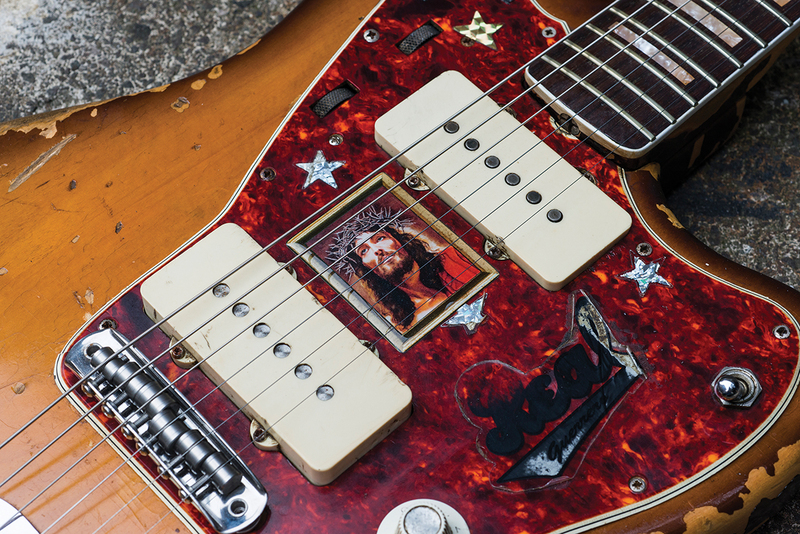 “Or Old Jesus as I call it!” Grant chuckles, in relation to the sticker between the pickups. “That’s my first one – the one that I did the swap for. 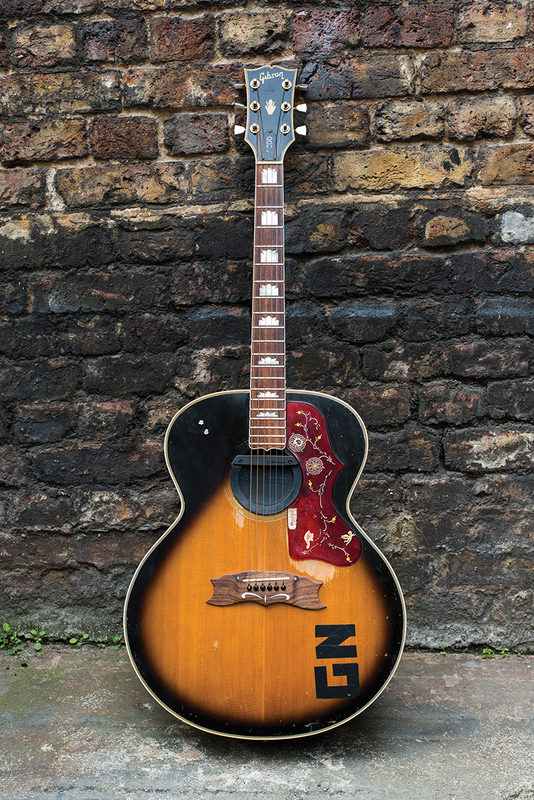 It’s my most sentimental one – my ’59 is the one that I use for recording, but this is the one that people know me for, because that’s the one I’ve most used, and the one I used on the main stage of Reading back at the 90s. “Old Brown is a ’66, but it’s a bit of Frankenstein, yet it’s got a great vibe. It was worn when I bought it, but I’ve certainly added a fair bit of wear to it over the years – it’s been thrown around a bit. 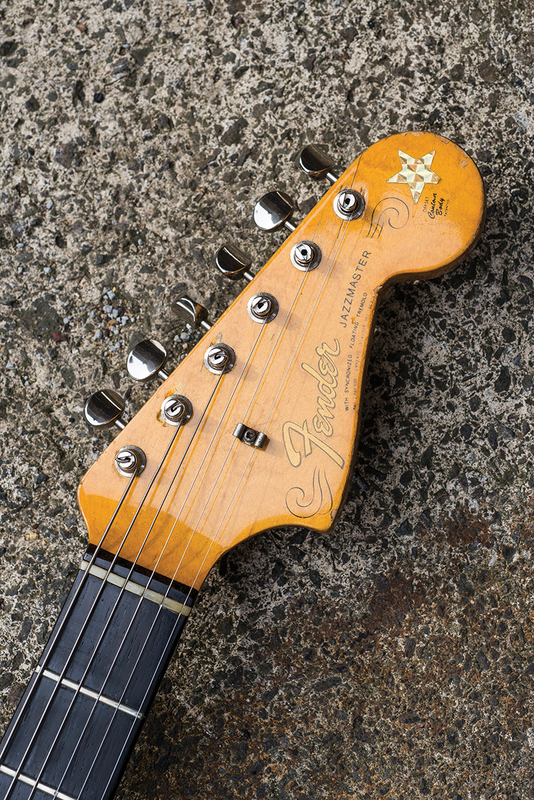 It’s got a really lovely neck, it’s got a great sound and I really love the square inlays and the binding on the neck – that’s my personal favourite era of Jazzmaster, with the big headstock. It’s got a lot of character, it plays really well. “The pickups I use live in all my Jazzmasters are Seymour Duncan Quarter Pounders, because they give me that really fat sound. I’ve used other pickups, but the Quarter Pounder for me just covers a lot of ground in Feeder – I had humbuckers in there for a while, I had a JB in the bridge for a while when I was using my amps in a different way, but now I’m mainly on single coils it’s difficult to switch to a humbucker guitar when the amp is set a certain way. 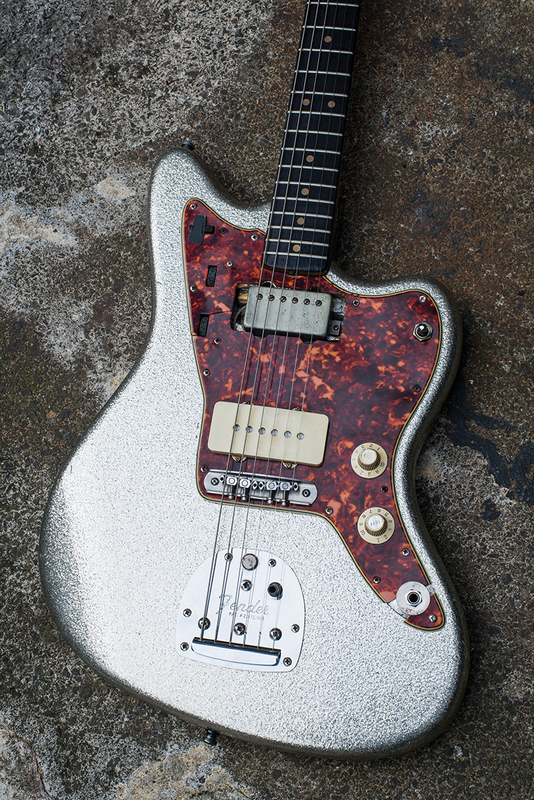 Another of Grant’s signature guitars is a 1964 model that’s been finished in eye-catching silver sparkle finish. “It’s another iconic guitar for me,” he enthuses. “That’s on a close par with Old Brown because I’ve had it almost as long. It was originally like a dirty white colour. It’s a ’64, but again that’s got a Seymour Duncan Antiquity in the front and a Quarter Pounder in the bridge. I think it had two humbuckers in it at one point. Then when I moved back to single-coils I swapped the bridge out but I kept the neck pickup, because it really has that really fat, really creamy sound that I need for some of the solos and guitar lines in Feeder, so it’s just nice to have one that does that. “For example, there’s a song called Turn that has this really filthy guitar sound on the solo, so to compensate for that I hit the front pickup and it gives that fat, saturated sound. So yeah that one’s called Wales, and I’ve had it for a long time – I actually had it refinished in that silver sparkle, and that’s kind of become another trademark for us. I’ve actually got two matching ’64s in silver sparkle, but this is the one with the most history. 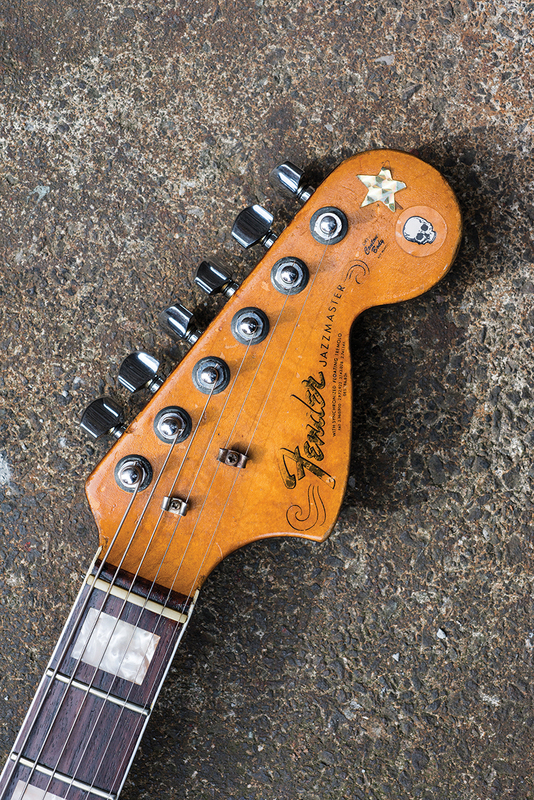 “That one’s got a Mastery Bridge in it – Old Brown has got a Staytrem. 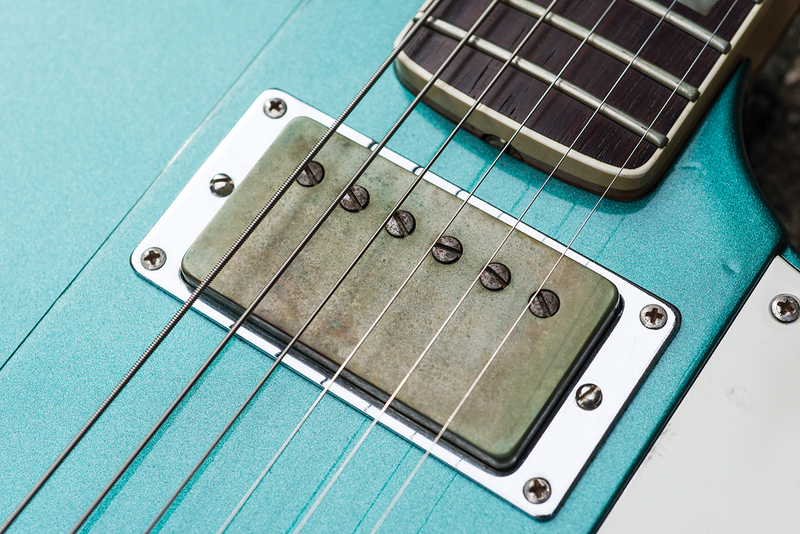 They’re really good – I was just buying the Mustang bridge online from Fender or Allparts, but when I tried the Staytrem I was really impressed. It’s probably my favourite bridge to use as a replacement. I’ve always changed my bridges to the Mustang-style unit, because it’s better for live use, and also I tend to fix all my bridges so they don’t really move. It’s just better for tuning. “Staytrem do one that has a thicker post that’s more of a fixed one… but I only found that out afterwards! So I wrap copper tape around the posts so it’s really wedged in there. It’s the sort of thing I’ve done since I started playing them in the early 90s. It’s quite hard to find, you buy it in art shops. 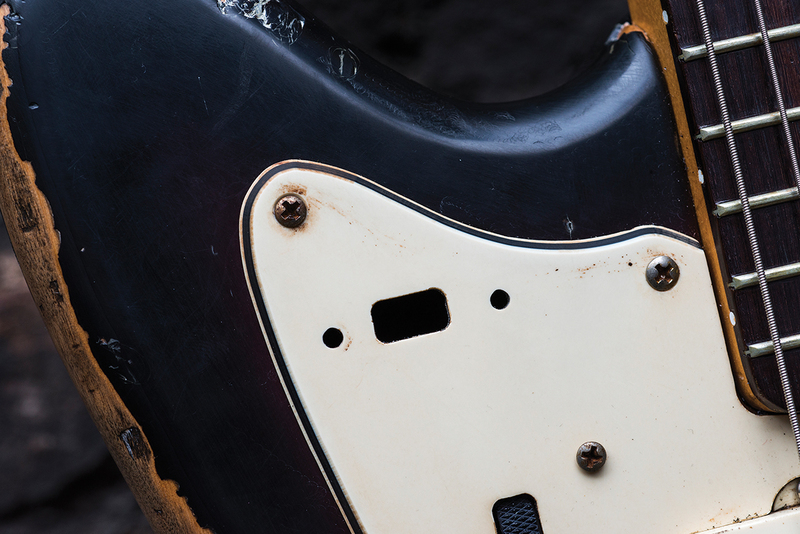 Grant clearly has a thing for sunburst Jazzmasters, but his late-80s Japan-made example has seen a bit more abuse than it might initially appear. “That’s got a real history to it,” Grant remembers. “God, we’re going back a long time ago… I bought it in Japan, and it was cheap. It was a nice guitar to play, and I think I used that guitar at Reading at one of our big main stage appearances. 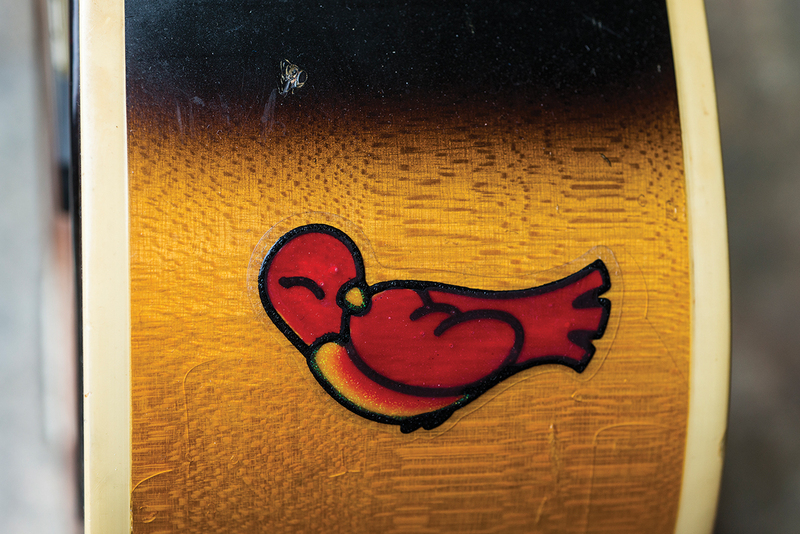 If you look at any of the early Feeder footage, it used to have an oval Feeder sticker on the top of it. “Basically what happened was that it’s been completely trashed over the years! 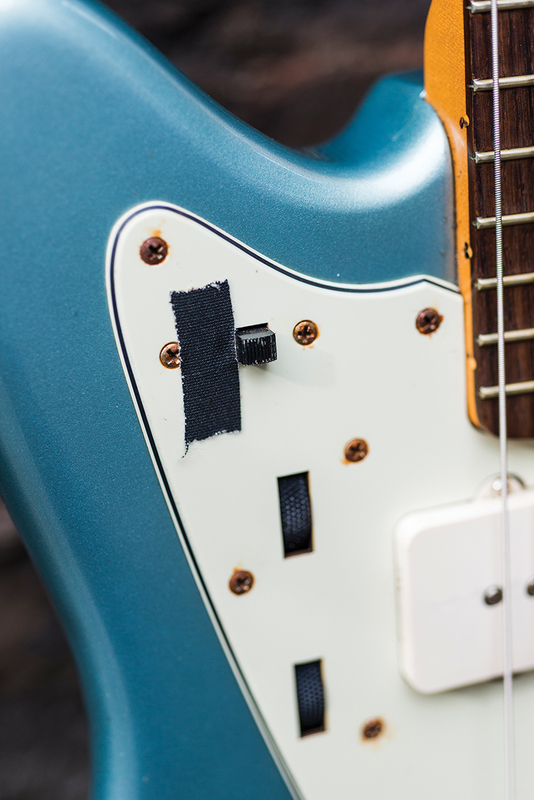 I took the neck off it, and put the neck on another Jazzmaster, I don’t know why I did it, but it was just this body that’s been living there for a while – this body with a broken scratchplate. I think I might have smashed it and thrown it against the wall a few times to make it look a bit more messed up for the Renegades video. But yeah, to cut a long story short, Taka started doing this thing called ReBirth Guitars, and that was one of his first experiments. 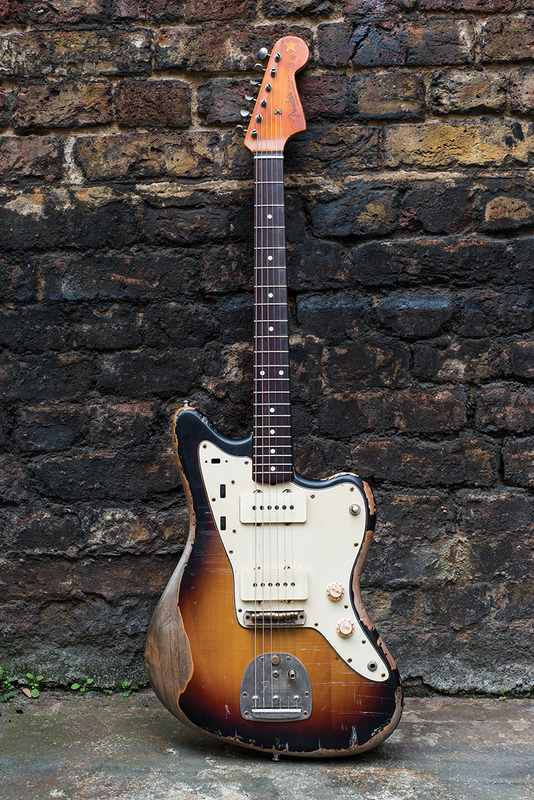 While some of his Jazzmasters have more sentimental value, there’s one guitar that is without question his favourite instrument, and one that is always his first call in the studio – his Sunburst ’59. 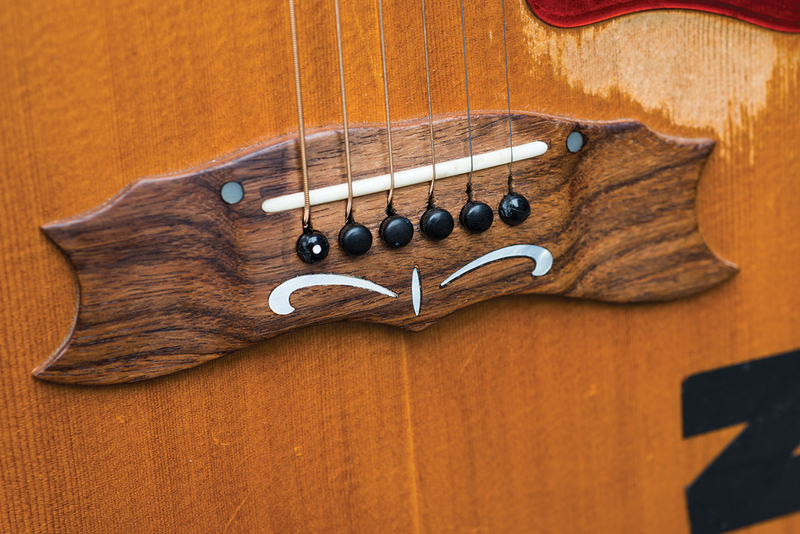 “That’s my holy grail – it’s an all-original ’59,” he enthuses. “I got that after the success of Comfort In Sound – me and Taka went down to Vintage & Rare and he bought an old Jazz Bass. It was outrageous, I think I bought like three guitars in one go! The ridiculous thing is that it wasn’t even that expensive – it was a bargain. It’s got the original case and everything. It’s just a beautiful guitar. I haven’t changed the strings on it since Generation Freakshow, because I just love the sound of those dead strings. That’s the guitar I use most for Feeder recording – even for the heavy stuff, it’s on virtually everything. 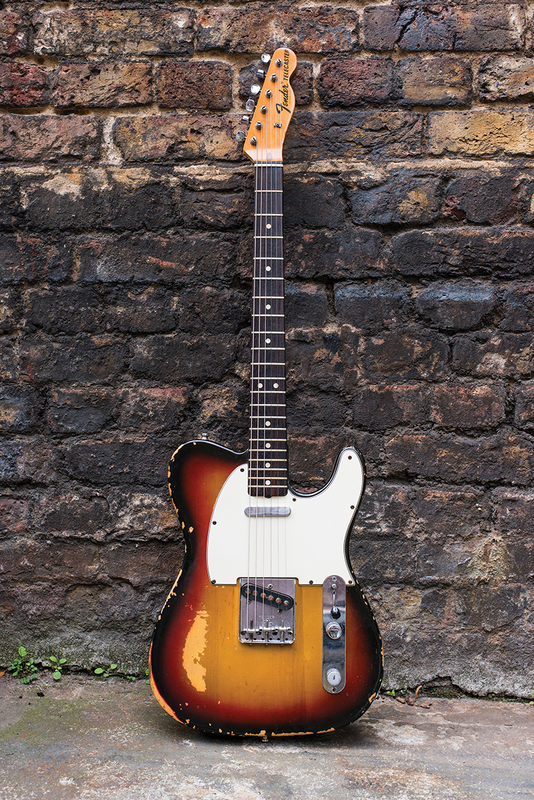 It’s not all Jazzmasters in Grant’s collection, however – he’s got a variety of classic and esoteric instruments to call on, including his battered early 70s Sunburst Tele. “When I bought that guitar I was with Taka, we used to go to this guitar shop in Richmond quite a lot, and this guitar was just there for sale. And at the time no-one was really playing Explorers unless they were in a metal band, but I quite liked that, and it was a cherry one as well, so it didn’t look quite as metal. 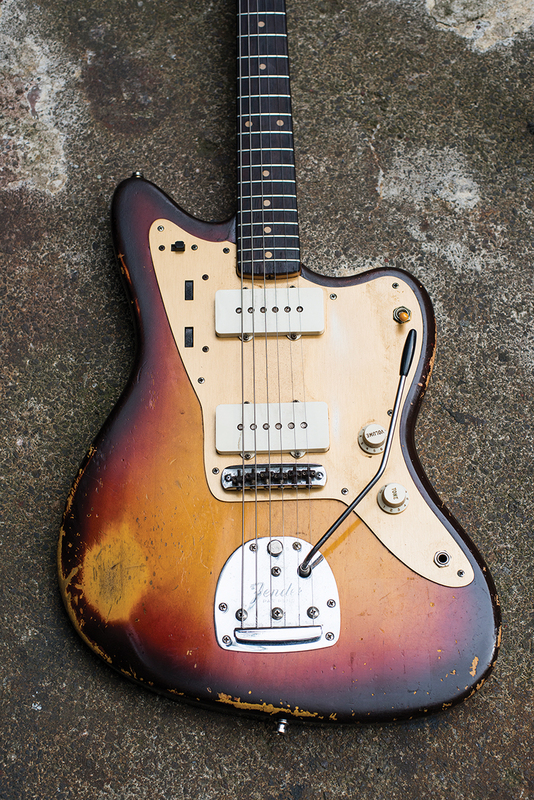 Perhaps the most interesting Jazzmaster-style instrument in Grant’s collection, however, is another of the fruits of Taka’s ReBirth project –a full custom build that he calls the TeleMaster. “He’s got a bit of a taste for it now!” Grant jokes. 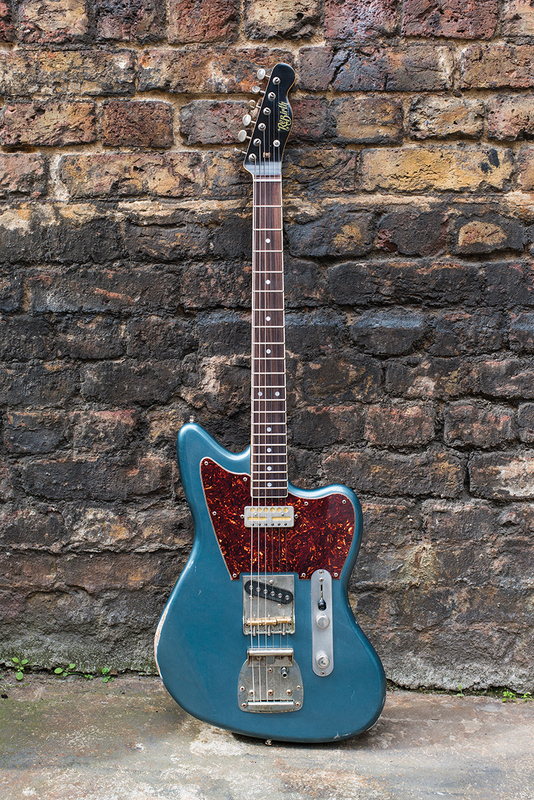 “He made this one for me that’s basically a Tele-Jazz idea, similar to what the Custom Shop was doing with the Offset Tele, but I asked him if he could make me one that is more faithful to the Jazzmaster look. The final electric in Grant’s collection is another esoteric instrument – a Firebird-meets-Jazzmaster hybrid made by Combat Guitars in Japan. “This was made for me by a friend of Taka’s that used to work at Combat – they were a small company in Japan,” Grant explains. 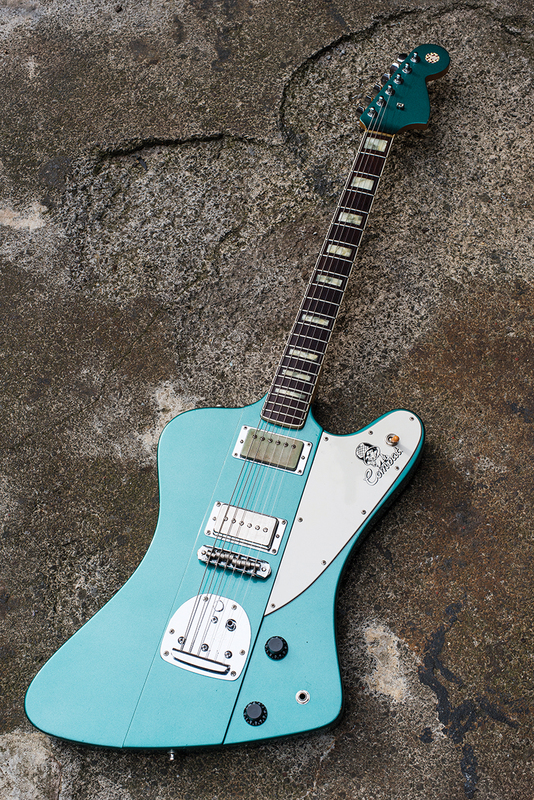 “I wanted something that was a cross between a Firebird and a Jazzmaster, so I named it the Jazzbird, and it’s kind of a one off. I wanted the Jazzmaster trem, the big headstock, the square inlays in the neck, and I wanted the body to be thicker than a standard Firebird because I wanted a bit more weight and a bit more balance as well. 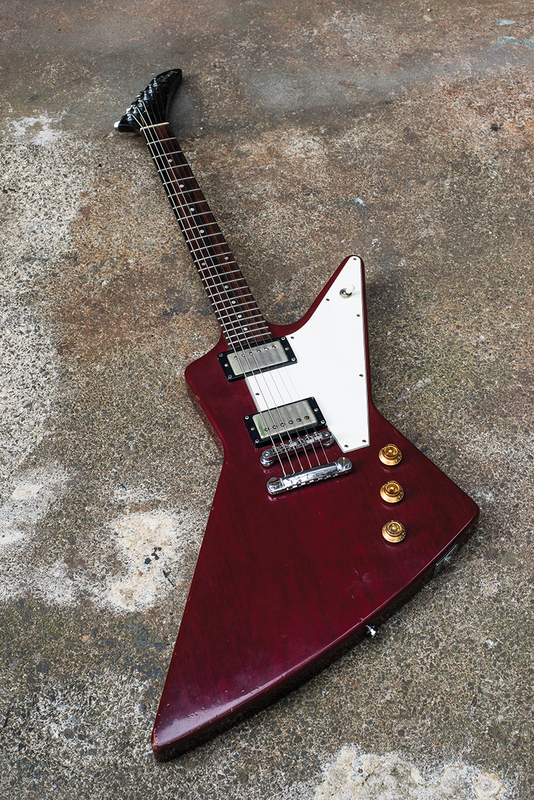 That’s the problem with Firebirds, unless you move the strap button they tend to lean forwards – they look cool but they’re not the most comfortable things to play. 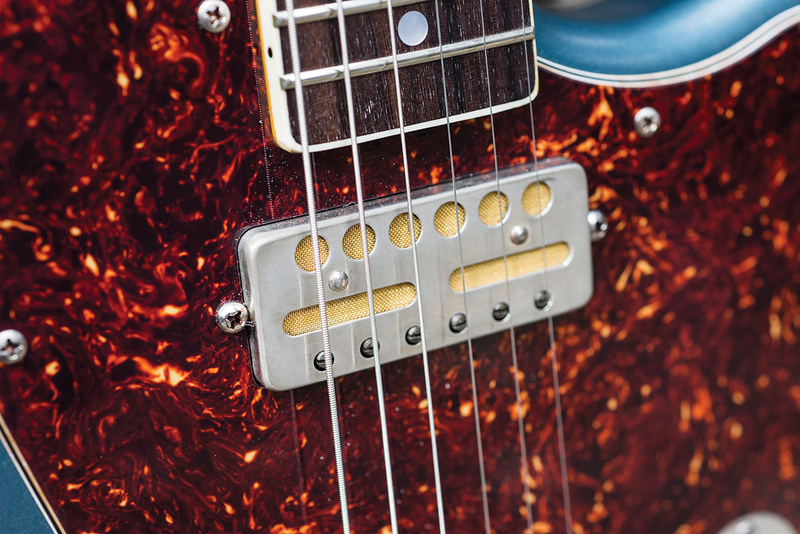 “The original had two Tom Holmes humbuckers that sound fantastic, but I recently changed the bridge humbucker to a Seymour Duncan P-90, but in a humbucker casing. I haven’t really had time to get to grips with it yet and I’m not sure it’s the right one, but I do want to get it back out in time for the hits tour, because that’s what I’m using on our singles album sleeve and in the Come Back Around video, so it feels wrong to not to use it for something! It’s not all electric guitars in Grant’s collection, however, and when it comes to acoustic, Grant has a few key instruments he uses for live work and songwriting. 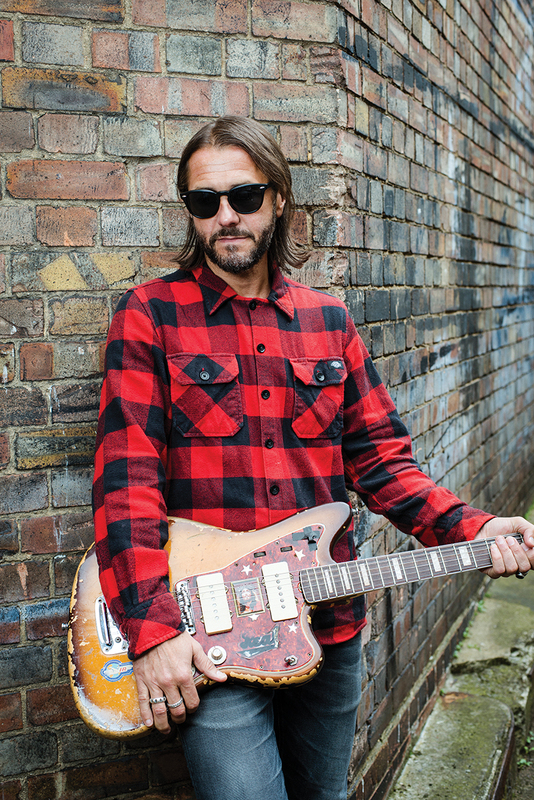 “I write pretty much all of Feeder’s stuff either with the ’59 or with one of my acoustics,” he confirms “That’s what I’ve always chosen to write on. 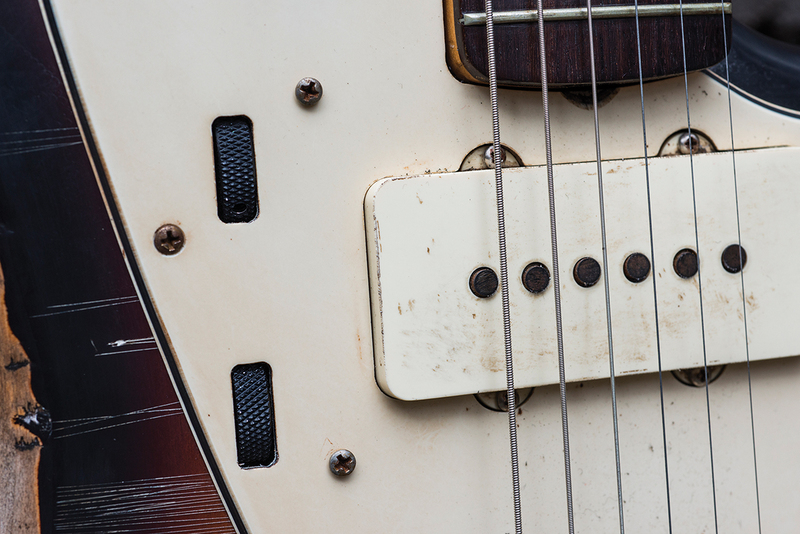 My Guild is an M-20, I’ve got two of them – I’ve got a ’64 and a ’65, that one is the 1965. I absolutely love those guitars, they’re so good for fingerpicking. Again I hardly ever change the strings because I like that organic, dead sound for fingerpicking. “I was on tour in the US with Everclear and we did a gig in Idaho,” Grant remembers. 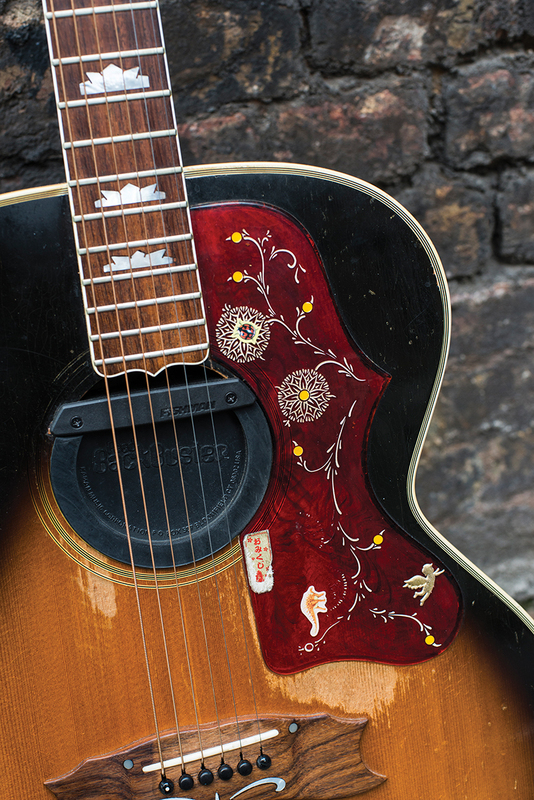 “We went to a vintage guitar shop and I saw it there, and I fell in love with it. I didn’t have enough money at the time but it was really cheap… crazy cheap. It was like 500 dollars or something. And it had the original case with a handle that looked like somebody’s belt, loads of stickers on it and the bottom falling out. It just had so much character to it. I remember thinking, ‘Oh I really want to get it but we’re a bit tight for cash’. 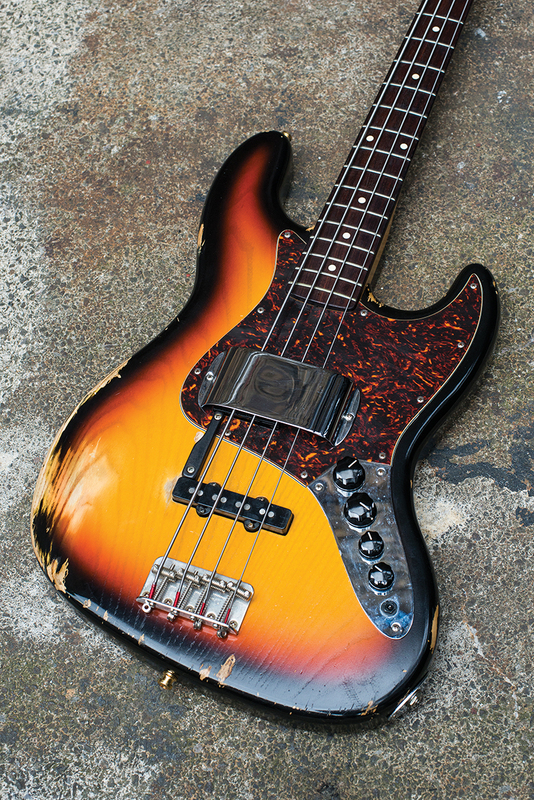 It’s hard to improve on the classics, and that’s exactly what Taka has in his 1968 Jazz Bass. 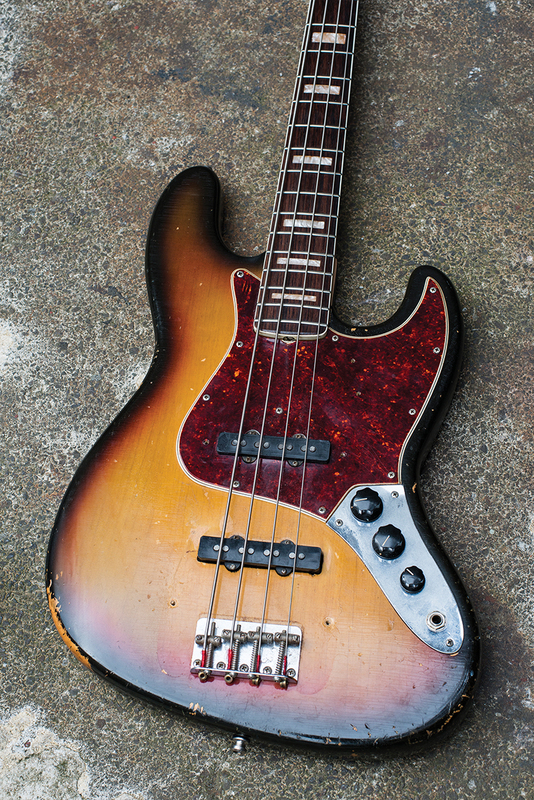 “Before a gig one day I was in second-hand music shop, and tried this Jazz Bass,” he tells us. “It was so nice and so good – but I didn’t have time to buy it because I had to go back to the venue to do a soundcheck, and I never got it! 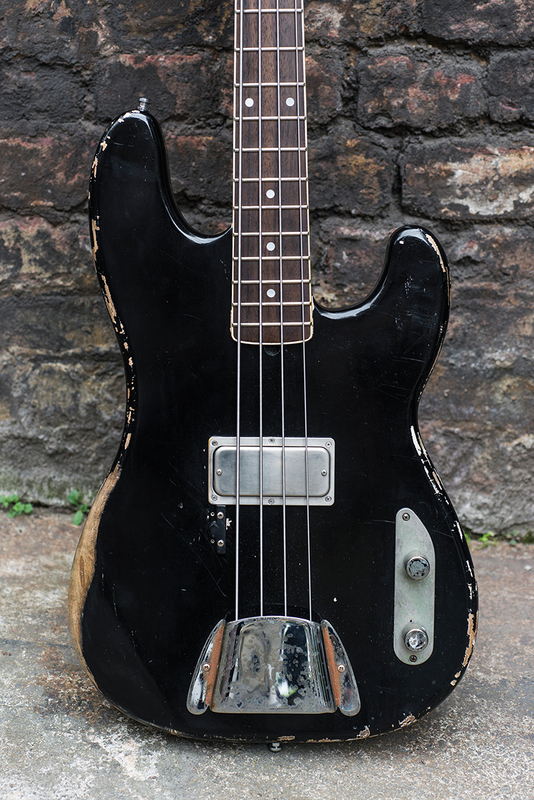 I’ve just done a nice old Jazz Bass body and neck…’” he remembers. “I was like, ‘Ooh that would be nice!’ But I asked him to make me a Jazz with precision pickups, which is why it’s got the big pickup cover on it – it’s actually a Precision pickup on the front and a Jazz at the back. So that’s my main recording bass. It was great, because as soon as I had it, it had that feel of a vintage instrument. 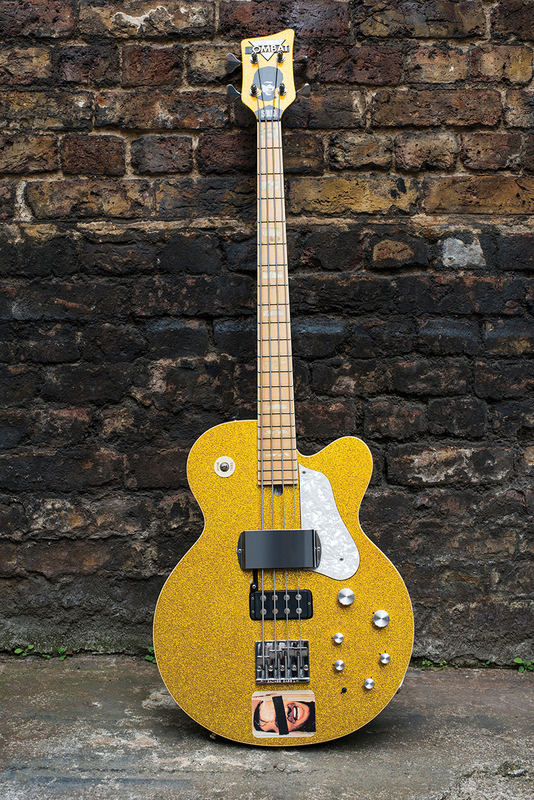 Two of Taka’s most famous and familiar basses are a good deal more unique, and have also come to him through the friendships he made in his time at ESP, and the most famous one of all is his gold sparkle Combat bass, which he used at the height of Feeder’s chart-troubling success. 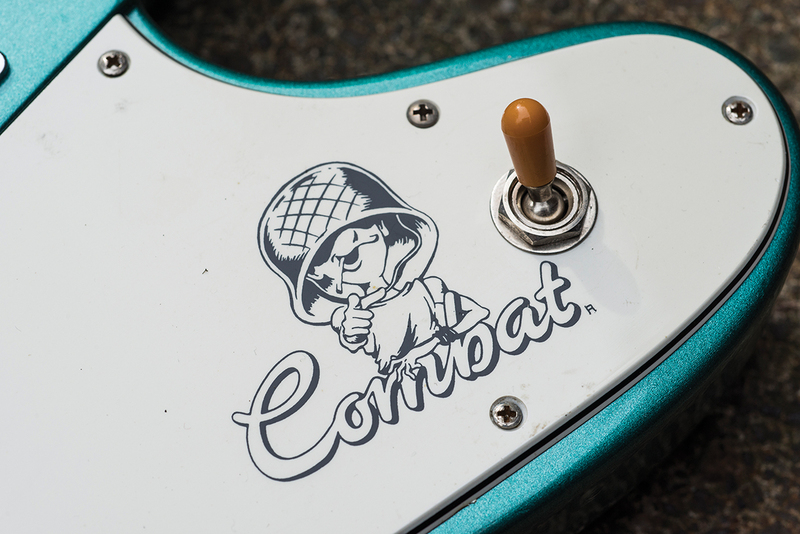 “Unfortunately the C on the headstock logo has gone, so now it’s ‘Ombat’” he chuckles. “Another friend of mine started to work for Combat, and I asked him to make a bass for me. I had a semi-acoustic Gretsch bass that I always loved, and I used it for videos a lot, but I can’t use it live because it’s fragile and has no bottom end. 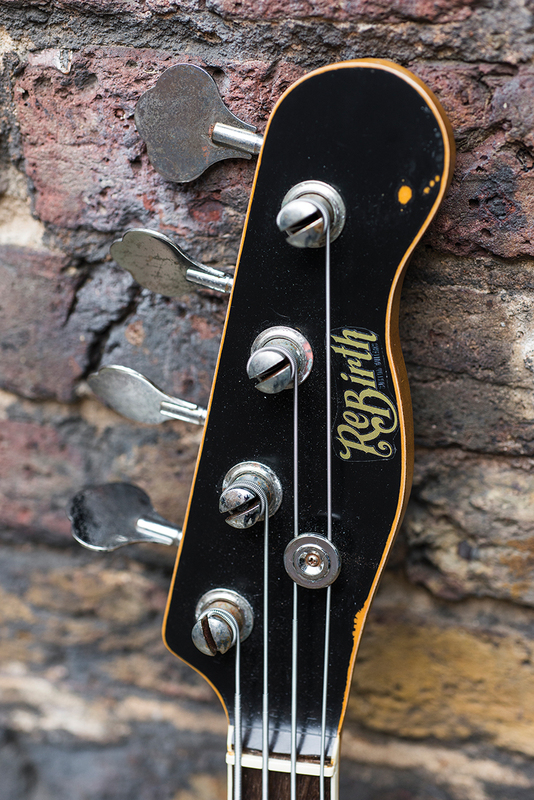 As you’d expect for a four-string stalwart, ReBirth isn’t just about guitars, and the black relic’d P-bass style bass is his self-made weapon of choice. Clearly he’s hit onto a cool recipe that smashes together classic designs with top-end parts and cool paint jobs – but we have to wonder how he got into building guitars again? “Well, one by one my friends left ESP or the guitar business or whatever,” he says, “And then Kaz, because he’s independent, he can’t give me a freebie any more! When he used to work for ESP it was all, ‘Oh Taka I made this – take it!’ But now he’s independent he can’t, so I thought that I should maybe just do it myself! “I started out just customising because I didn’t want to do too much. I found this company called Mojo Pickups, who are also in Yorkshire, and I was like, ‘I’ll support local business!’ But when I did some more research I found out that Mojo Pickups are actually really interesting. 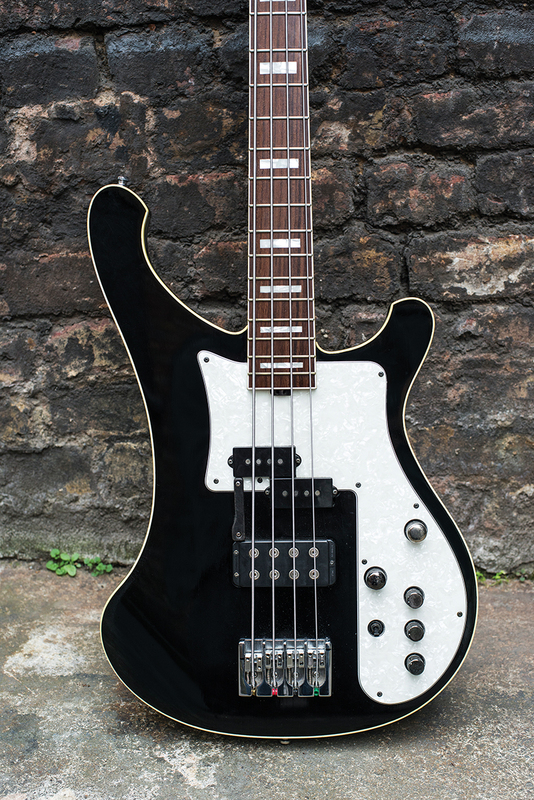 I really love the looks and the sound as well – I’ve never actually met him but we’ve become good friends because I always buy pickups off him! He made some Thunderbird pickups, which I use on my ’51 P-bass type. “So at first I was just customising cheaper Fenders, Squiers and Epiphones I found on eBay, but then I was like, ‘Hmm, these are actually quite expensive… maybe I should start to build myself!’ So that’s how it extended from customising to actually building. Now I’ve got my man cave – I used to do it in the kitchen but my girlfriend kicked me out! So I asked my neighbour, who’s got this really nice brick shed that they’re not using, if I could go in there, so now I do all my work in there! Feeder’s combined hits/mini-album collection, The Best of Feeder/Arrow is out now on BMG.